These are completely irresistible. 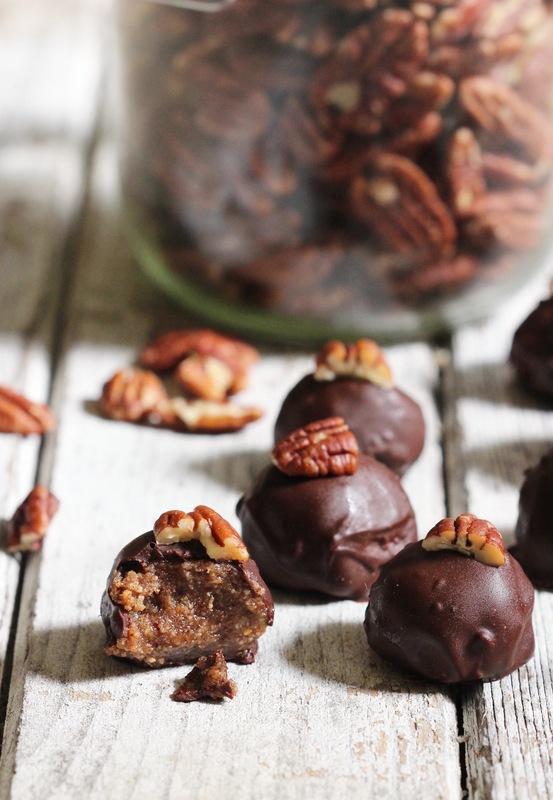 I love making homemade chocolates and these ones are hard to beat. 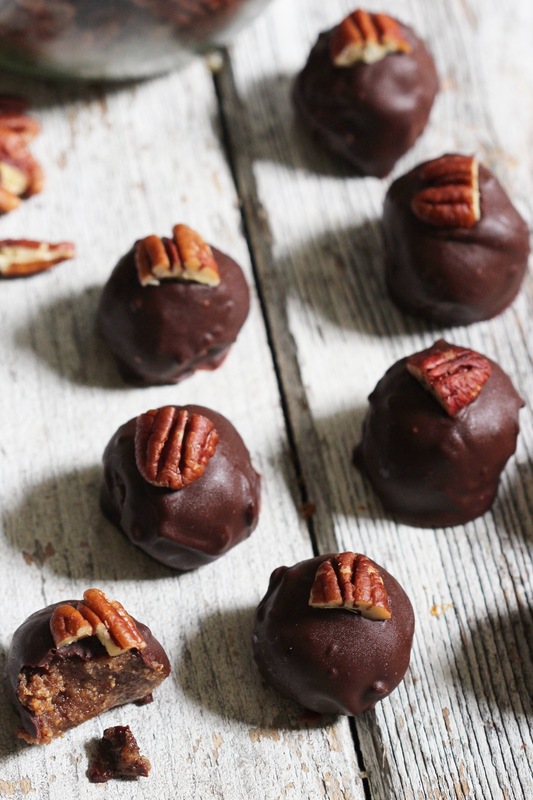 Pecans always remind me of Thanksgiving so I’m sharing them just in time for next week. Roasted pecans have the most gorgeous flavour so there’s just a tablespoon of maple syrup needed to sweeten the whole batch. A pinch of coarse salt takes them to the next level, it’s pretty impossible to stop at one! Add them to your food processor and blend until fine. Drizzle in the maple syrup and melted coconut oil and sprinkle in the salt and cinnamon (if using). Blend on high for about a minute until you have a smooth paste- you want it to be nice and smooth but dryer than nut butter. 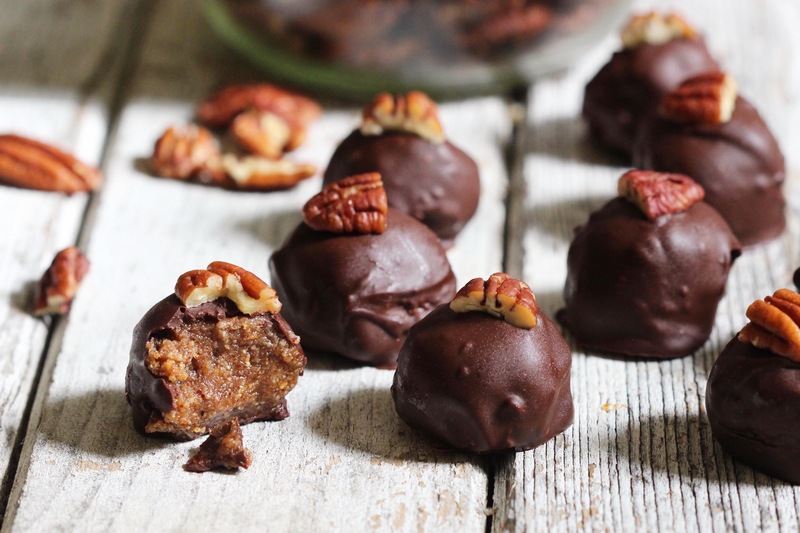 Roll the mixture into balls and pop them in the fridge while you melt the chocolate. When it’s melted, stir in the coconut oil. Dip each truffle in the chocolate to coat and lay them out on a board covered in parchment paper. Pop them in the fridge to set before serving. Hi Indy – how long will they keep. Thinking of doing for a dinner party. Hi!! I love all your recipes and I am enjoying getting through your book. Would these be suitable for freezing?